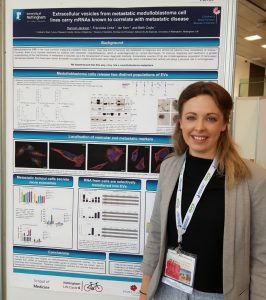 We asked Hannah Jackson, a first year PhD student at CBTRC who recently attended the International Society of Extracellular Vesicles (ISEV2018) conference in Barcelona, to share her advice on making the most of an academic conference. Conferences, whether you are a student or a supervisor, provide a change from the lab and an exciting opportunity to learn more about the current research in your field. CBTRC researchers are fortunate to benefit from funds provided by Research Grants, the University and CBTRC donors to support us in attending these events. And, we want to make the most of the opportunity. However, the enthusiasm may begin to wear off when you have to deal with stressful poster printing, airport delays and 7:30am sunrise sessions! That’s why I have put together some tips on how I survived my first international conference. The cost of most conferences increase substantially as you get closer to the run up to the event, so make sure to book it as soon as possible to take advantage of the early bird registration fees. From the moment the conference starts it’s go, go, go!!! Days were planned out from 8am until 8pm with barely any breaks. As this was my first big conference I was worried I would miss important sessions because several sessions overlapped, therefore I spent a lot of time before planning my itinerary so that I could attend as many sessions as possible. Looking back, I should have skipped a few sessions and enjoyed the Barcelona sunshine, as five days of constant science is overwhelming for the best of us! Even if you have planned everything right, having time for lunch and making sure you get refreshments, doesn’t always work out. So, having small snack to hand, like a cereal bar (or two), will help keep you energy levels lasting all day. Whether it’s a poster or a talk, make sure you bring something to present at a conference, because this will force you to talk to people. The thought of standing by my poster and presenting my work to experts in the field terrified me. I was so worried that my work wasn’t good enough, that I wouldn’t be able to answer questions or that people would be critical of me. However, by the time my poster session had finished (I actually ended up staying an extra 15mins after the poster session had ended as my poster had proved quite popular) I realised that all my worrying, stressing and skipping lunch had all been for nothing. The poster session was fine, people were very nice and gave me great feedback. It was also a really great confidence booster; having experts in the field be interested in your work gives you such an amazing lift. It is always important to make connections with companies developing the latest technologies in your field. New companies are always emerging, others are rapidly evolving and it’s almost impossible to stay on top of it all. This is the opportunity to meet companies on a personal level and build connections which may benefit you in the long-run. At ISEV 2018 industry booths were set up around the poster sessions, I stopped at booths run by Norgen and SBI who sequence small RNA-samples. It was important for me to discuss my project with them and see how they could help me, they also gave me lots of freebies, including a t-shirt and a water bottle! I know it’s extremely hard to resist the urge of hanging around with people you already know, but one of the most important reasons for going to a conference is to network. The people here are your potential future joint authors and research collaborators. Meeting people from other labs can help you make a more informed decision about what to do next and where to go in your career. It also provides you with the opportunity to learn about what other labs are doing and for other labs to get to know you; if you play your cards right one of these labs could be a future employer. Also, go to the conference dinner, don’t expect the food to be great (I learnt the hard way that the Spanish don’t cater well for vegetarians! ), but take the opportunity to mix with interesting people outside of the research environment. Hannah Jackson is supported by the James Tudor Foundation, University of Nottingham Life Cycle 7, and the University of Nottingham School of Life Sciences.